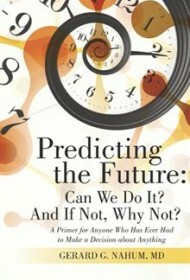 Predicting the Future: Can We Do It? And If Not, Why Not? When we make decisions, what information do we require? How do we know that we have the correct and sufficient information on hand to make a decision that will lead to the intended outcome? Gerard G. Nahum approaches such questions from the perspective of information theory, although he relies also on other disciplines, including physics, philosophy and statistics. The author’s scope, however, is larger than our day-to-day decisions. He attempts a complete epistemological theory that deals with such perennial topics as the nature of thought, consciousness, causality, and chaos theory. Nahum is mainly concerned with placing limits on knowledge, on understanding what we are capable of knowing and what must remain mysterious. Although he attempts to open the possibility that free will and determinism are compatible, he places the opportunity for freedom within a world he assumes to be deterministic. It’s no surprise then that he makes a very strong connection between knowledge and measurement, believing that qualitative judgments are a subset of quantitative ones. A weakness of the book here and throughout is that Nahum makes this assertion without examining or refuting alternative views. Like many grand philosophical syntheses, the book’s sweep is very broad, and many of his arguments are unsubstantiated when examined in detail. However, the book is well-organized and evinces a considerable intellect. The book’s contents are presented in outline form in the concluding chapter. Readers might peruse this outline before reading the corresponding chapters to enhance comprehension. While the author’s arguments may not convince skeptics, those inclined toward his worldview will enjoy this synthesis, which skillfully brings together ideas from several parallel fields into a comprehensive whole.